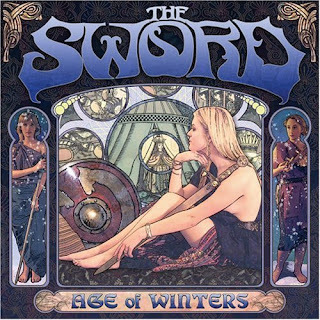 Stay Right Here a Little While...: THE SWORD: "Age of Winters" and "Gods Of the Earth"
THE SWORD: "Age of Winters" and "Gods Of the Earth"
The Sword. 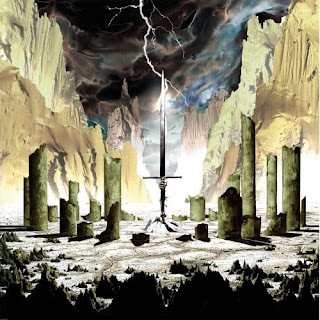 Borrowing a few ideas from doom-maestro's Black Sabbath and Pentagram and mixing them up with speed metal a la early Mettalica and Slayer, these guys blew me away about a year ago when I picked up "Gods of the Earth"(2008). Let me tell you, that is one hell of a heavy disc. It's dizzying at times with non-stop pummeling guitar work, crushing riffs, slightly detached Ozzy-esque vocals, bizarre high fantasy lyrics, and non stop head-banging grooves throughout. It's hard to pigeon-hole this band...they are masters of the heaviest of both '70's and '80's metal at the same time. If there is such a thing as wearing out a CD I have come close to it with this one. The Sword made it big I believe when they got a song from their first album, "Age of Winters"(2006), on Guitar Hero 2. The song was "Freya". While not as great as "Gods of the Earth", "Age of Winters" is still a pretty solid album. It's not quite as fast paced, and the vocals sound repetitive after a while. "How Heavy This Axe", "Maiden, Mother, and Crone", and "Freya".